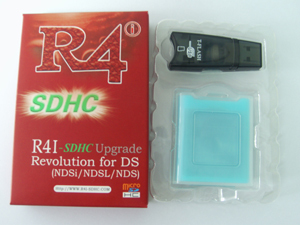 A new flash cart dubbed the R4i (yes, that’s R4i, a pun for the name R4 for the DSi) for the new Nintendo DSi which is hitting US soil this April 5 (the DSi release date). No word if this still comes from the R4DS maker since it’s not on their official site plus the fact that selling of R4 is illegal by law in Japan. The cart however, is already on sale on the interwebs. If you haven’t been around the DS scene lately, all current flash carts don’t work with the DSi, save for maybe the one from Acekard and the R4i, the R4 for Nintendo DSi. Here’s a video of the R4i on Nintendo DSi. Support SDHC micro sd cards (4GB、8GB、16GB、32GB). At the risk of being Captain Obvious, this just needs saying. If the R4i works, then other flash carts for the DS and DS Lite like EDGE will be getting a for DSi iteration. Personally though, I would avoid anything with the R4 name in it. The R4 offered less than carts that went on sale beside it. The R4i does offer more but the stigma is already there so buy at your own preference. If you’re looking for a this car though, you won’t find it on Amazon and Ebay as Nintendo had it banned. You can get it elsewhere on the internet though. If you’re looking to update your r4i firmware, just check out r4i’s updates. To everyone who already got an R4i already? Post your review. Does r4i really work for the New Nintendo Dsi. It is about $19 online. 4coolday says can support JP-DSi, EU-DSi and US DSi . Where do you download the r4i firmware? can i use the r4 for the ndsi? Yes you can use the largest 16GB Micro SD card with an r4i , they’re great! I have a 2GB micro SD that I used for my R4. Will is still be able to use that? I think I read somewhere that the lowest the R4i can use is 4GB. Is this true? And I wont be able to use the internet if I have a R4i? I have an R4 with 4gb MiniSDCard for the DS Lite. Would we be able to play those games stored in the SD Card if I plug that in to the R4i? The link for R4i’s updates is posted. Just read the post. i love the fact that it has the option of Simplified Chinese and “Complicated” Chinese. now HOW in the world do u connect the flash drve into ur DSi!?! i’m planning to get a dsi, should i get an acekard or an R4i? which one works well with DSi?